11/09/2018 – Nature has been very generous to German vineyards this year. Vintners are blessed with an outstanding 2018 vintage. Find the results of The German Weininstitut’s (DWI) latest survey among estates that harvested Trockenbeerenauslese berries this year or still expect them to be picked. As DWI (i.e. Wines of Germany HQ) points out, this year’s 2018 noble-sweet specialties will be unique because berries were extraordinarily healthy when they dried into raisins. Therefore, vintners are right to expect exceptional high-quality wines. Growers often reported must weights of over 200 degrees Oechsle, that is to say the sugar content of the grape’s juice exceeded by far the must weight minimum of 150 degrees Oechsle required for ‘Trockenbeerenauslese’ wines.In order to obtain such noble-sweet wines, berries were laboriously picked by hand which sometimes took several days. As a result, yields were low which makes these wines precious and rare. According to a recent survey by Wines of Germany (DWI), the output mostly reached volumes of 50 to 200 liters only. Vintners mainly picked berries from Riesling grapes to produce ‘Trockenbeerenauslese’ wine. Moreover, they harvested berries from the varieties Pinot Noir or Scheurebe to serve the same purpose. The deciding factor for this year’s fine wines is the balance of high residual sugar content and fresh fruit acids. The wines have an alcoholic strength by volume of not more than seven per cent in general, sometimes even lower. This is what distinguishes them from sweet wines produced in southern countries. Noble-sweet wines are the perfect accompaniment to sweet desserts, and they can also expertly be paired with blue mold cheese. In addition, they are best enjoyed as aperitif and promise maximum enjoyment on festive occasions, too. German ‘Beerenauslese’ and ‘Trockenbeerenauslese’ wines are highly appreciated worldwide and regularly win some of the most prestigious awards in international wine competitions. Find the results of the recent DWI survey below. 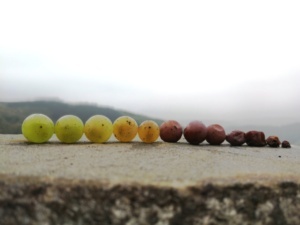 Some 80 estates that harvested Trockenbeerenauslese berries this year – or still expect them to be picked – took part. The list does not claim to be exhaustive.